Republicans have suggested that a newly released text in which two FBI officials discussed drafting talking points for President Barack Obama is evidence that he meddled in FBI investigations. It’s unclear exactly what the text is referencing. Republicans seized on a newly released text message Wednesday in which two FBI officials discussed a request by former President Barack Obama to know about everything the bureau was doing. The texts are between FBI lawyer Lisa Page texted Peter Strzok, a leading FBI investigator at the time who had been involved with the bureau’s probe of Hillary Clinton’s private email use as secretary of state as well as the early stages of the Russia investigation. That’s according to a report published online Tuesday by the Senate Committee on Homeland Security and Governmental Affairs, and first reported by Fox News early Wednesday morning. But the context of the text – and whether Obama was indeed attempting to interfere in an FBI investigation as the Senate report suggested – remains unclear. A footnote in the report suggests it cannot be confirmed that Page’s text was related to the FBI’s investigation of Clinton’s private email server, but presumes that it is related to the probe because the message was not redacted. 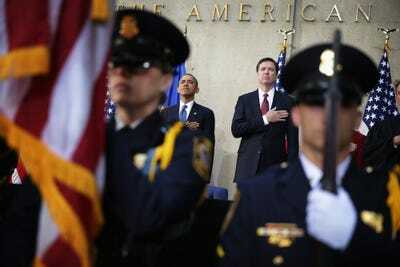 Alex Wong/Getty ImagesFormer President Barack Obama and then-FBI Director James Comey attend a swearing-in ceremony at FBI Headquarters on October 28, 2013. Despite the ambiguity over the meaning of the text, some Republicans and right-leaning media outlets concluded it implicated Obama in a larger conspiracy to prevent Trump from becoming president. “[This text] means the president wants to know what they’re doing to try to stop Trump,” Republican Rep. Louie Gohmert told “Fox & Friends” Wednesday. “We need to get to the bottom of this and find out what [Obama] knew and when he knew it,” he added. In an April 2016 interview with Fox News’ Chris Wallace, Obama said he didn’t get involved with pending investigations at either the FBI or the Justice Department. On Wednesday, The Wall Street Journal provided some clarity on the context of the text, citing associates of Strzok and Page who said the text referenced internal preparations to brief Obama on Russia’s interference in the 2016 election. The text message preceded Obama’s trip to the G20 summit that year, where he said he confronted Russian President Vladimir Putin on September 5 about the Kremlin’s election-meddling efforts. But the timing of when the text was sent – which occurred after the FBI concluded the Clinton email investigation and during the bureau’s probe into Russia’s meddling in the 2016 presidential campaign – appears to be the point of concern for Republicans. July 2016: The FBI begins investigating Russia’s interference in the US election. July 5, 2016: FBI Director James Comey announces the end of the bureau’s investigation into Clinton’s private email use as secretary of state. September 5, 2016: Obama meets with Putin and reportedly discusses Russian meddling in the US election. September 28, 2016:Strzok learns that the FBI has discovered hundreds of thousands of emails – some of which could be pertinent to the FBI’s concluded Clinton email investigation – on Anthony Weiner’s laptop. Weiner was married to Huma Abedin, a top Clinton aide. October 28, 2016: Comey announces that the FBI is reopening the Clinton email investigation, based on the emails discovered a month prior on Weiner’s computer. November 6, 2016: Comey announces the FBI found nothing in the additional emails, and reiterated the bureau’s earlier conclusion that Clinton should face no charges for her handling of classified information. November 8, 2016: Election Day. The Journal said the one-month gap between the FBI discovering the additional Clinton-related emails and Comey’s announcement that the FBI was reopening the Clinton email investigation is the subject of an ongoing probe by the Justice Department’s inspector general into whether there was any wrongdoing at the FBI in the run-up to the 2016 election.